Summer is the time for travel and family vacations, which means there are more drivers on the road. But an increase in summertime driving also means there are more car accidents, and Amica Insurance is offering tips to help ensure safety if the unexpected happens. The U.S. Department of Transportation says that summer – not winter – is the most dangerous driving season. Summer is the time for travel and family vacations, which means there are more drivers on the road. But an increase in summertime driving also means there are more car accidents. That’s why Amica Insurance is offering tips to help ensure safety if the unexpected happens. Make sure everyone is safe. If anyone is hurt, call 911 for help, and don’t try to move them. If possible, move the car to a safe location to avoid blocking traffic. Also, turn on the hazard lights. Call the police. If they write a police report, remember to get the incident number. Stay calm and courteous, but be cautious. Gather contact information from any witnesses. Take photos of the scene and any vehicles or objects involved. 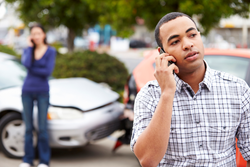 File a claim with your insurance company immediately.